My aunt, my mom and I have been making the same toffee recipe for years. And I still love it. But recently I decided to experiment with a different toffee recipe that might even yield superior results. It is based on a recipe meant to emulate Enstrom's toffee, which I've never actually tried. My friend who has had Enstrom's said that this one is quite different, but still delicious! 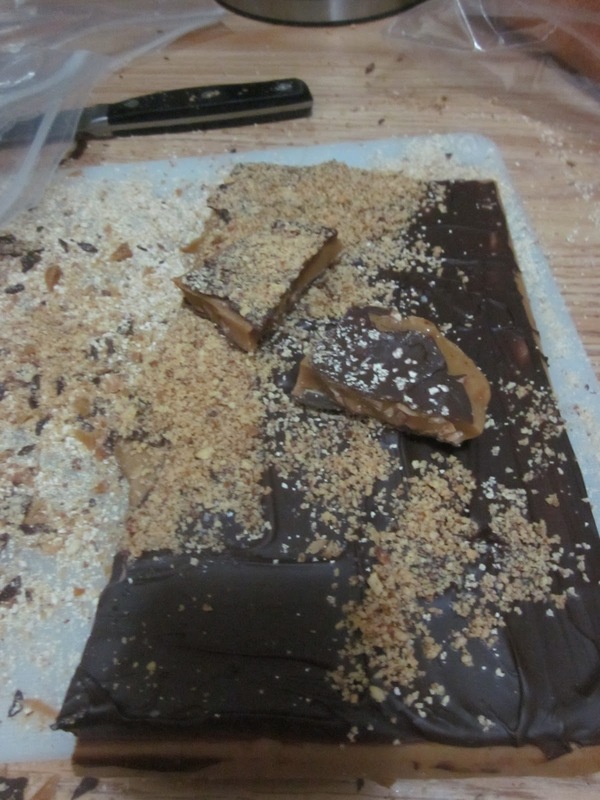 Compared with the sinful toffee bars, the almond toffee is definitely more labor-intensive and time-consuming. So, take your pick, and know that you'll have delicious results either way! 2. Line a cookie sheet with aluminum foil. Then place the crackers edge-to-edge in rows. 3. In a saucepan, bring butter and sugar to a boil, stir for three minutes until thick. 4. 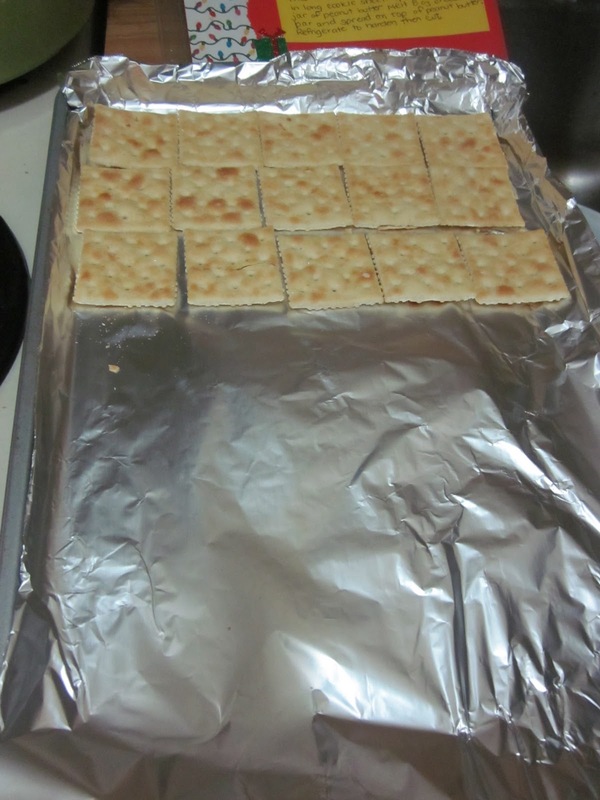 Pour mixture over crackers and bake for 5 minutes. 5. Remove from oven and sprinkle chocolate chips over toffee. 9. Bring to room temperature for about 15 minutes before reaching or cutting into pieces. 1. Melt butter in a saucepan over medium heat. Add regular salt. As soon as the butter is almost melted, add in the sugar and stir with a wooden spoon using slow, figure-eight motions. 2. Once the sugar and butter have become completely absorbed and smooth (about 10-15 minutes), add the slivered almonds. 3. Continue to stir for another 10-15 minutes until the toffee reaches a dark color caramel. Using a glass of cold water as a tester, aim for the hard crack phase (according to the Joy of Cooking, this has occurred with the droplet turns into a brittle thread into the water). If you have a candy thermometer, aim for 290 degrees. 4. Spread mixture on a large cookie sheet and place on a cooling rack to cool for 30 minutes. 5. After the toffee is hardened, melt half of the chocolate over a double boiler and spread a thin layer over the toffee. Sprinkle with 1/4 tsp sea salt and 1/4 cup powdered almonds. 6. Let cool and then flip the toffee over in the cookie sheet (I had no problem with sticking and did not grease the sheet). Melt the rest of the chocolate, and spread a thin layer over this side of the toffee. Sprinkle with 1/4 tsp sea salt and 1/4 cup powdered almonds. 7. Place in the refrigerator to cool for at least 2 hours before breaking into pieces. Because this toffee is thicker than the sinful toffee bars, I find that it breaks much more easily while maintaining its layers.